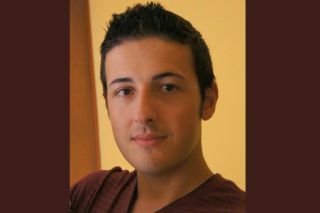 Bruno Gulotta was on holiday in Barcelona, Spain, when a van struck and killed him on Aug. 17, 2017. We lost a friend and a colleague to terrorism yesterday (Aug. 17). Bruno Gulotta, 35, an employee of Tom's Hardware Italy — a brand owned by Space.com parent company Purch — was on holiday in Barcelona, Spain, strolling along Las Ramblas with his partner and two young children, when he was struck and killed by a van that also took the lives of 13 others and injured more than 100. When he was hit by the van, Bruno was holding his 5-year-old son Alessandro's hand. His son was yanked away to safety by his mother, who had their 7-month-old daughter, Aria, strapped to her chest when the van struck. The terrorist group ISIS has claimed responsibility for the attack, and authorities have arrested at least four suspects as the investigation continues, according to the Associated Press. "While many of our offices are no stranger to the realities of terrorism, it is particularly sobering when tragedy takes one of our own. Please keep Bruno and his family in your thoughts and prayers as well as our EU team members who are dealing with the very real existence of danger and loss in their daily lives," Mason said. Bruno was mourned and remembered by his friend and colleague Roberto Buonanno, the country manager for Tom's Hardware Italy, in a story we have translated and reposted below. If you would like to donate to Bruno's family, contributions are being collected through a PayPal account Buonanno set up for this purpose: paypal.me/famigliabrunogulotta. Today is a day of mourning for us. We all come together with affection for his companion, Martina, and his two small children. Here are our memories of Bruno, as written by the country manager of Tom’s Hardware for Italy, Roberto Buonanno. The news came to us suddenly yesterday evening during the laid-back week of Ferragosto [a holiday celebrated in Italy]. Our colleague and friend Bruno Gulotta was run over and killed by a terrorist in the heart of Barcelona. He was there on vacation with his companion and his two kids. He was posting on Facebook, and everything seemed like a typical vacation: a photo from Cannes, one from Las Ramblas in Barcelona. And then something that no one expects: the death of a young man, father and partner of the mother of his two children. We spent the evening and night trying to stay lucid, and communicate the news to our colleagues and close friends; many wondered if this was a macabre joke or reality. And then we started to read online publications, competing to collect as much news, photos and videos of this young Italian, dead in a terrorist attack in Barcelona. It is a tragedy that strikes us in so many ways, one more dramatic than the other. We are thinking of his companion, Martina, who, with the strength of a young mother, must now face something nobody should have to. We put ourselves in the shoes of little Alessandro, who is preparing to start elementary school, knowing that his life and family will no longer be the same. And then we think of little Aria, who will not remember the horrible scene, but will never know her dad. Bruno was a point of reference, a central figure for all those who knew him. For us at Tom's Hardware, he was an important pillar who helped hold us up. Anyone who worked with him — whether it was customers, suppliers or web stars — was impressed by his kindness and professionalism. He had an insatiable hunger for knowledge, and he was a real enthusiast — one of us — even though he later decided to move full time to marketing and sales. And in that role, I have never known a more capable person. He loved to study every aspect of his profession. He was an insatiable reader and avidly searched for perfection. We talked for hours and hours about our productivity and our personnel development systems, and exchanged many letters seeking guidance. Anyone who had a problem with a computer, software or web platform could ask and find a solution by coming to Bruno, even if they didn't work with him. That’s because Bruno was a truly generous and heartfelt person. He was able to lead a rich family life and a brilliant professional career with a balance that I will always admire. Personally, Bruno helped keep my feet on the ground. Every time we had a problem or a question that required my approval, I talked with him. And this went beyond just business. We talked about the education of children, vaccines, alternative medicine, diet and physical fitness. I don't know how I will be able to endure, seeing his empty desk in our office across from where I work, and I think about how much I will miss his company. And then I realized that it is a selfish thought, because everything that counts now, and that's important, is giving maximum support to his family, to whom we will always be available. Rest in peace, Bruno. We will always remember you. Considering that you have always been a life force, I swear to you, even through your last act on Earth, you have taught me a profound lesson. You will always be in my thoughts every time that I feel the need for a voice of a friend, as if you would always be there, as you have always been, at every hour of the day and in any moment.